The Chocolate cichlid (Hypselecara temporalis) derives its common name from its rich red-brown coloration. The fish has a deep, bulky body, attractive finnage, and a flat, rounded face. If you spend a lot of time with it, this big cichlid can become really tame and eat from your hand. The Chocolate cichlid can exceed 12 inches in length and you should therefore be prepared to house it in a big aquarium as it grows older. It is fond of digging and substrates with sharp edges must be avoided. Efficient filtration and regular water changes are necessary to keep the water quality up, and the temperature should be kept around 75 degrees F. If you plan on breeding chocolate cichlids you should provide them with flat stones or a piece of drain-tile since they are known to appreciate flat objects as spawning sites. A varied and nutritious diet is necessary if you want your Chocolate cichlids to stay happy and healthy. They can grow amazingly fast when provided with sufficient amounts of food, but keep in mind that a lot of food means a lot of waste products that will foul the water unless you regularly remove the nitrogenous compounds. Chocolate cichlids are eager eaters in the aquarium. High-quality ichlid pellets can be used as a base and supplemented with plenty of brine shrimp, red worms, chopped up earthworms and other types of meaty foods. When a pair has been formed, they will chose a suitable spawning site and defend the surrounding territory from all intruders. They will also meticulously clean the spawning site together prior to spawning. During courtship, it is common for both sexes to show off in front of each other by twitching their bodies. When you notice this type of behavior, keep feeding your fish plenty of live food and carry out a major water change. If possible, time the water change with lowered barometric pressure since the combination of these two factors will mimic heavy rain. During spawning, the female will deposit a large number off eggs. Females that have spawned a few times can actually produce over 500 eggs per spawning. The parents will guard the eggs and defend the territory from intruders. They will also remove any unfertilized eggs to prevent fungal growth. The eggs needs roughly four days of incubation before being ready to hatch and the emerging fry are actually quite small when you consider the size of their parents. The fry will be free swimming within a week. Juvenile chocolate cichlid - Hypselecara temporalis. In some cases, the parents will keep eating their own eggs and/or fry and seem completely unable to grasp the idea of parental care, regardless of how many times they spawn in the aquarium. In such a situation, you need to set up a separate aquarium and move the eggs as soon as they have been fertilized. If you are unable to arrange a separate aquarium, at least place coarse gravel in the parent aquarium since newly hatched Chocolate cichlid fry can fall down among the coarse gravel and hide from their cannibalistic parents. A 10 gallon aquarium is big enough to raise the fry in to begin with. Include live plants, e.g. Java moss. In addition to making the fry feel more secure in the aquarium, live plants will act as a home for microscopic organisms on which newly emerged fry can feed. A sponge filter will help you keep the water quality up, but frequent water changes will still be necessary. When you start feeding the fry live food, a small water change should ideally be carried out after each feeding session, or at least once a day. Microworms will be accepted even by really small Chocolate cichlid fry. As the fry grow bigger, you can start supplementing the microworms with powdered cichlid pellets. 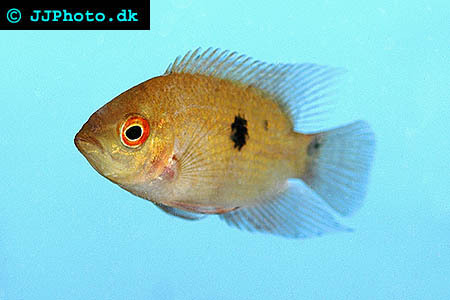 Chocolate cichlid fry are known to have a really slow growth rate to begin with. If you manage to keep them alive, this pace will however increase dramatically after a while.